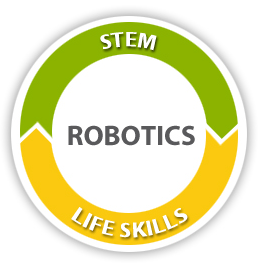 Robotics is being widely used all over the world to make education for engaging and holistic. Next Robotics is a solution, offering a holistic empowerment program for a child. It aims to develop core life skills in a student along with helping him or her to integrate and apply STEM learning in order to solve real problems. The core of the solution is its pedagogy and its enablers - a modular robotics platform and visual programming language. It places the student at the center of the program and empowers the student with the requisite knowledge. The hardware and software gives the students the flexibility and creative freedom to approach the any problem with infinite solutions. 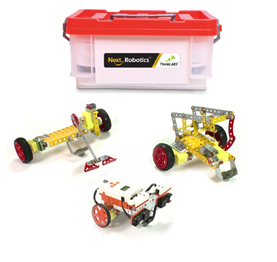 The NextRobotics kit is complete educational robotics platform which includes a variety of different components. The kit is designed to make it easy for young roboteers and have enough flexibility to retain the interest of seasoned roboteers as well. Reprogrammable microcontroller unit - Also called the brain of the robot, it can interface upto 6 sensors and 3 motors. Sensors - In all the kit includes 9 sensors of 5 different types. Motors - there are 3 geared DC motors to give a robot different motions. 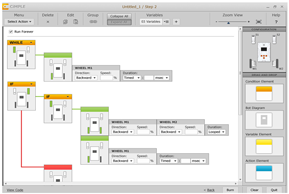 A Visual Programming Language is one of the best ways to start programming. The base for strong programming skills is a strong logic building foundation. While using a VPL the student is not caught into the syntax trap and is able to focus on building a solid logic for the program. The CiMPLE VPL is specifically designed for robot programming and makes the task of up and running very easy. The visual programs are easy to create and understand, which lowers the entry barrier to programming. For a robotics program to be successful it needs a strong content linked to it. The NextRobotics content has been made after 2 years of research and feedback from more than 200 schools across India. It includes curriculum relevant content from classes 4th - 9th available in digital format. Choosing the best possible option. At each and every stage the student has to think critically, and take decisions along with his team to solve the problem. This entire exercise builds self-confidence as well gives the student a sense of accomplishment which increases the intrinsic motivation in a child to learn and develop.